a. Description: The major edible species of yam of African origin are white Guinea yam (D. rotundata Poir. ), yellow Guinea yam (D. cayenensis Lam. ), and trifoliate or bitter yam (D. dumetorum Kunth). Edible species from Asia include water or greater yam (D. alata L.), and lesser yam (D. esculenta[Lour.] Burkill). Cush-cush yam (D. trifida L.) originated from the Americas. White Guinea yam and water yam are the most important in terms of cultivation and use. Yam is grown in about 51 countries in the tropics and subtropics, with yields averaging about 11 metric tonnes/hectare in the major producing countries of West Africa (Nigeria, Cote d’Ivoire, Ghana, and Bénin). b. Trade volume: According to statistics from the Food and Agriculture Organisation of the United Nations, an estimated 48.7 million tonnes of yam were produced worldwide in 2005, with sub-Saharan Africa accounting for 97 per cent of this figure. In Nigeria alone, export earnings from yams hit N56bn in 2008, up from N37bn realised in 2007 and about N70bn was realized from yam export last year. In 2008 the World production of yam was 51.4 million tonnes per year out of which Nigeria accounts for an average of 36.7 million tonnes, Ghana for 3.6 million tonnes and Cote d'Ivoire for 4.8 million tonnes. The figures underpinned the socio-economic importance of yams. Farmers have constantly affirmed that yam cultivation is a veritable source of income. According to statistics, average daily consumption per capita of yams is highest in Bénin (364 kcal), Côte d‘Ivoire (342 kcal), Ghana (296 kcal), and Nigeria (258 kcal). c. Harvest: In many parts of West African yam zone, mature yams are harvested at the end of the rainy season or early part of the dry season, which coincides with the end of vegetative growth. Yams for long-term storage (for marketing or seed) are usually harvested during the harmattan period (Dec-Jan) in many parts of southeastern Nigeria when the crops have attained maximum growth and maturity. e. Specifications: Yam specification varies from one buyer to the other in terms of weight, length and diameter. Generally exportable yam should have the following characteristics. f. Uses: Fresh yam tubers are peeled, chipped, dried, and milled into flour that is used in preparing dough called amala (Nigeria) or telibowo (Bénin). Commercial products based on dry flakes or flours from the tuber are produced in Nigeria, Ghana, and Côte d‘Ivoire for export and sale in urban areas. Yam tubers can be conveniently processed into yam floor and yam chips & pellets. The consumption of yam flour cuts across cultural, religious and demographic boundaries. It is a cherished delicacy when served in the form of "Samolina" or "Samovita", with well prepared soup. Apart from serving as food, it has a lot of industrial uses. It is used in production of all-purpose-adhesives. The adhesives are used by producers of cartons, packaging companies and lather and shoe producers. The all-purpose adhesives is produced with yam or cassava starch. Some industries particularly in Europe use yam flour in preparation of high quality biscuits, bread, cakes to mention but few. 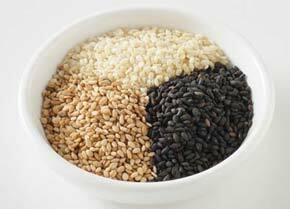 In Nigeria also, it is used in production of high quality bread and cakes. The yam chips and pellets can also play the same function as cassava chips & pellets in production of livestock feeds. Yam Starch has a lot of industrial uses. g. Export market: The major export market for yams from West Africa include Europe (England in particular) and the United States of America. 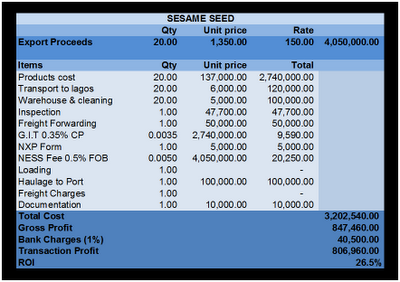 h. Export Price: sold in pallets at the rate of USD130-150 per pallet. ( a pallet contains about 40 tubers and it weighs about 25kg each ). 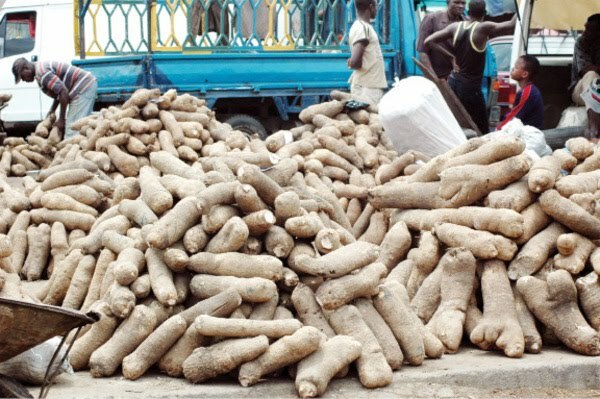 Therefore the export price per tuber will be USD3.25-3.75 FOB Lagos. i. Local price: The local price per tuber ranges from NGN100-200. j. Packaging and Freighting: Storing yams in modified atmosphere packaging (MAP) has beneficial effects, particularly using appropriate packaging material with suitable size and number of holes for gas permeation. Sealing yam tubers in polyethylene film bags reduced storage losses due to weight loss and development of necrotic tissue. Notwithstanding cultivar differences, fresh yam tuber can be successfully stored in ambient and refrigerated conditions. The recommended storage temperature is in the range 12°-16°C. Optimum conditions of 15°C or 16°C at 70-80% rh or 70% rh have been recommended for cured tubers. Transit and storage life of 6-7 months can be achieved under these conditions.